Lots of goodies for you speechies today! I'm finding myself with the first "down time" I've had in the last couple weeks - Between starting up at school, moving (no internet yet, oy! ), and working on my lingering grad school research project, there hasn't been much time to spare. But now I'm sitting at my desk with a couple free hours before the annual Back to School Night, and I thought I'd take the opportunity to share what I've been up to. Although it doesn't seem like there will be too much pressure on the specialists during BTSN (most of the parents choose to visit the classroom teachers rather than various services), I wanted to have a couple of general handouts ready. The first two handouts are my own creations. 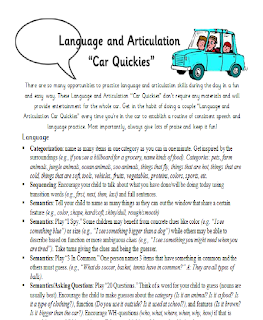 Grab a copy of "How to read With Your Student To Promote Language Skills" here, and "Language and Articulation "Car Quickies"" here. The third handout was created by Carrie Manchester, MS, CCC-SLP from Carrie's Speech Corner. Visit Carrie's Speech Corner to download your own copy SLP Vocabulary 101. 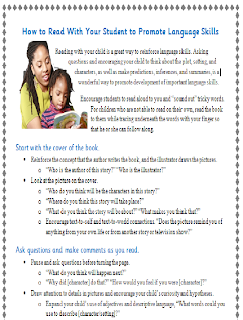 How to Read With Your Students to Promote Language Skills: You know I love using literacy in my therapy sessions! 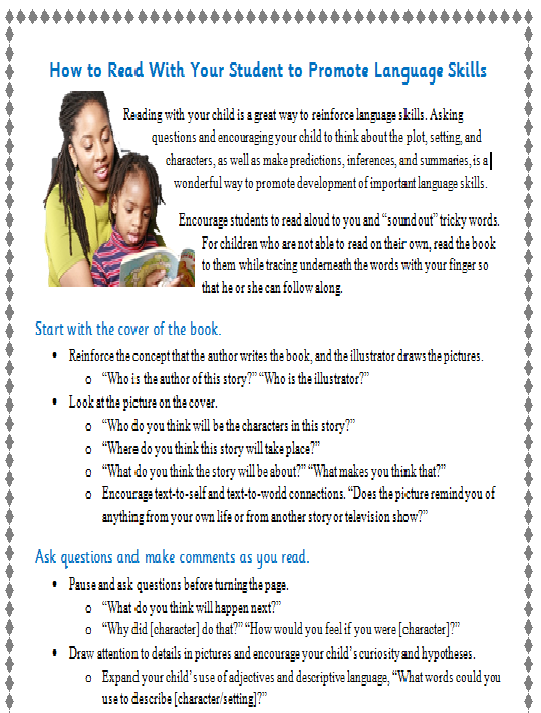 This handout helps parents make the most of their reading time and target language skills at home in the context of an (hopefully) everyday routine. 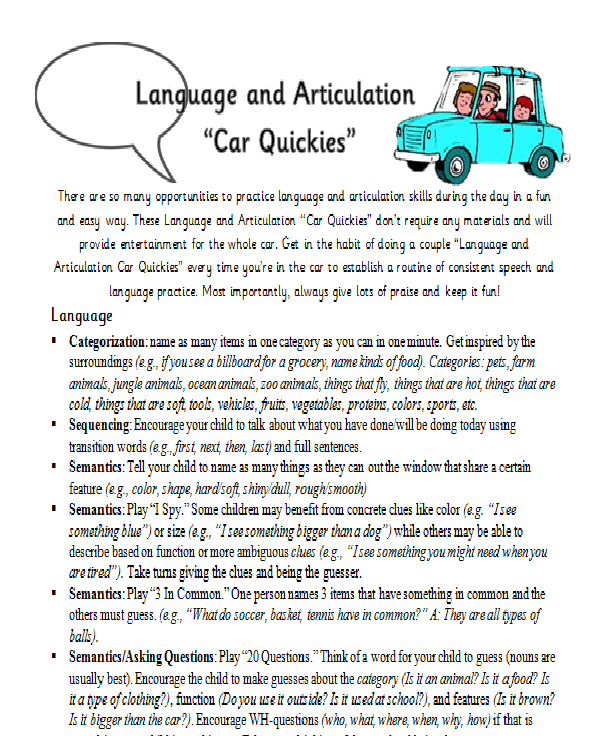 Language and Articulation "Car Quickies": I beleive that there is always time for practicing speech and language goals at just about every time in the day, and car rides are no exception! My hope is that if parents start to get in the routine of playing some of these car games, it will be a fun and easy way to accelerate student progress and reinforce some of the concepts we're targeting in therapy. SLP Vocabulary 101: Explains some of the common speechie jargon parents are likely to come across in conferences and reports. In addition to the handouts, I also got the bulletin board outside my room together with my 2nd and 3rd grade language groups just in time for BTSN. Check it out - I think it turned out pretty well! It reads: "Speech Stars describe using... Category, Feature, and Function." The students made lift-the-flap descriptions of something of their choosing (I left it up to them whether they wanted to do an animate or inanimate object - one kiddo picked a "suit" lol), by providing the category, function, and features, and drew a picture at the bottom. Here is a template of the activity.